Stephen Colbert's satirically right-wing, in-your-face pundit persona from The Colbert Report certainly made us laugh over the years. But I had to wonder: Would he come back whenever the new The Late Show host interviewed politicians? Colbert interviewed Republican presidential candidate Jeb Bush during The Late Show premiere on Tuesday night and it was actually a pretty chill affair. The was no fist pounding on the desk, no shouting, and no totally aggressive questions — except for that one asking how Jeb's views differ from his brother and former president George W. Bush. I mean, Colbert had to ask. After first guest George Clooney, Jeb sat in the guest chair to very light applause. The interview let Colbert flex his political muscles in a new environment as a new persona — himself. The comedian was relaxed, yet still on his toes, showing that this man is a natural in late night. Colbert teased Jeb about his brother George W., his family, his exclamation mark campaign logo ("Jeb! "), and even gave the Florida governor a lesson in how to be funny. Jeb told Colbert, "I don't think President Obama has bad motives. I just think he is wrong." The host points out the audience almost clapped, but held back. "You gotta pause til they clap and then hit 'em with what they don't want to hear." It was really refreshing to see Colbert not have a full-on persona in an interview — he seemed to be himself and having a great time doing it. If this is the way he'll be hosting The Late Show, I think he's going to be a fantastic replacement for David Letterman, who retired as host of the show earlier this year. You may have noticed a weird jump cut to the closing of the interview — and if you didn't, Twitter definitely did. According to New York Times writer David Itzkoff, a lot of the interview with Jeb was edited for time. 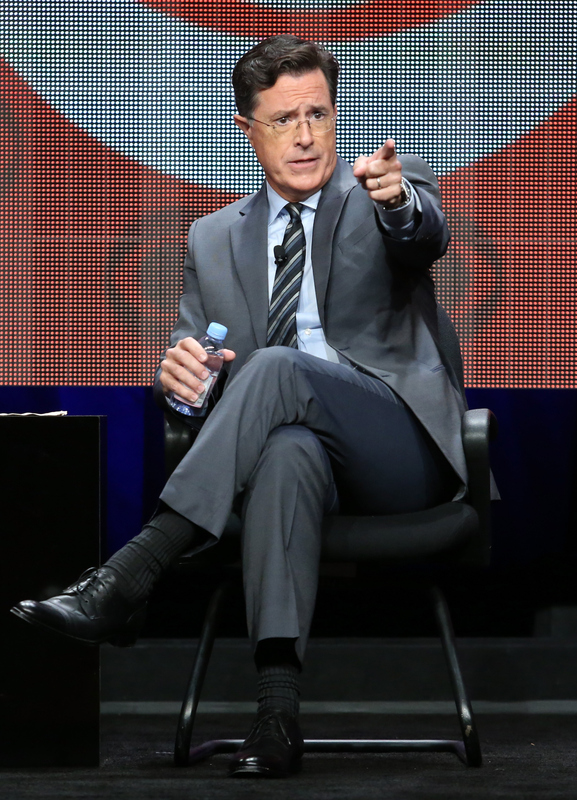 His review for the taping of the first episode states that Colbert actually did ask the candidate "straightforward policy questions about education and gun control." Iztkoff and Mediate writer Matt Wilstein tweeted about the gags that the at-home audience didn't get to see, like the winner of Jeb's campaign ticket raffle. Sounds hilarious and so Colbert.